Local Angelinos are just beginning to get used to the fact that bobcats and a mountain lion live in Griffith Park. Some locals are even still amazed that raccoons, skunks, and coyotes are thriving in the park. Now Angelinos can begin wrapping their heads around the fact that a population of gray foxes still remain in the park. Gray foxes are fascinating Canids (i.e., belong to dog family) that are one of only two Canid species that climb trees. The only other tree-climbing Canid is the Raccoon dog of Asia. Their hooked claws allow them to climb trees to escape danger or to find a home high up in the cavity of a tree. They are monogomous and do not live in packs like coyotes. Similar to coyotes, their omnivorous diet (fruit, small mammals) and adaptable behavior allow them to take advantage of urban and wild settings of North, Central, and South America. Gray foxes seem to either thrive in very spacious natural areas or very isolated or small fragments of habitat without coyotes. The key to their survival seems to be the density of coyotes and the amount of natural hiding places (e.g., shrubs, trees) available to hide from predators (e.g., bobcats, coyotes, mountain lions), but especially from coyotes. Coyotes are larger and have been known to displace or directly kill gray foxes because of their overlapping diets and habitat preferences in urban areas. For instance, they were very common in a study site I worked at in the Sierra Nevada Mountains of Northern California, where coyote density is not as high as Griffith Park due to the amount of space and woody ecosystem. However, they seem to not be as common or totally absent from isolated urban parks I worked at in Orange County that supported dense coyote populations. 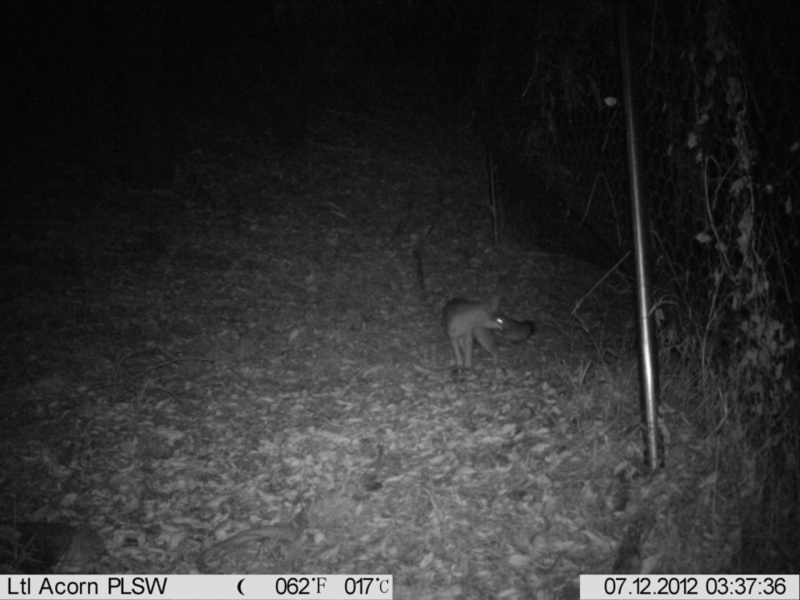 We are excited to inform Griffith Park supporters that the Griffith Park Connectivity study camera traps documented a gray fox. Prior to this, the Griffith Park Natural History Survey discovered tracks in 2007 and then Laurel Serieys of UCLA accidentally captured one in a bobcat trap in 2010 during her bobcat disease and anticoagulant study. Due to a scarcity of research, it is unknown exactly why they are rarely seen or seemingly absent from entire LA and southern California urban wildlands but high coyote density and a scarcity of woodland habitat may tell most of the story. Based on reportings by LA Zoo staff of a mating pair in the LA Zoo and an additional documentation by citizen scientist, Matt Whitmire (http://griffithparktrailcam.com/page/5), we know at least three patches of habitat where they continue to exist. The most logical oasis for gray foxes in Griffith Park is the LA Zoo because coyotes are excluded from the zoo for the safety of animals on exhibit. However, bobcats and gray foxes can easily enter zoo property. Outside of Griffith Park, gray foxes are known to live in the remainder of the less isolated mountain ranges of the LA area (e.g., Santa Monica mountains, San Gabriel mountains, Verdugo Hills, etc.) as well as some isolated fragments in LA. An orphaned gray fox was even discovered in a gutter in South Central LA!!! Some gray foxes seek refuge from coyotes in smaller urban parks and man-made/manicured habitat like orchards or golf courses where they face protective farmers and landscapers that use rat poisons or other lethal means to protect their property. The handful of urban gray fox studies suggest that gray foxes prefer the interiror of natural areas and that even urban gray foxes require access to some open space with native habitat. Although we feel very fortunate that Griffith Park is still vast and healthy enough to support gray foxes, it is unknown how many are left or if the population is sustainable. At the moment the resources are not available for scientists to do a LA or Griffith Park Gray Fox study but hopefully the opportunity for such an effort will come around sometime soon. Meanwhile dedicated local citizens are purchasing their own camera traps and utilizing social media such as http://griffithparktrailcam.com/ and http://www.cougarmagic.com/ to document gray fox and urban carnivore behavior and presence in the LA area with the intent of introducing the urban community to the amazing urban wildlife LA has to offer.